How does urban agriculture fit into the greater economy of Los Angeles? To understand the economic potential of the urban agriculture industry, this section’s research utilized theories of the New Economic Geography, a heterodox economic theory that investigates the different levels of development of places (particularly wealthy urban places versus poorer rural places) and how economies of scale affects economic growth. This researcher elected to focus on a farmers markets because they have historically been a distribution method utilized by those engaged in farming techniques that run counter to the industrial agricultural system. Altadena Farmers’ Market was chosen because of its high number of vendors growing and processing food in the city. Goods that are sold with little or no processing, such as citrus fruits, berries, lettuces, and avocados. 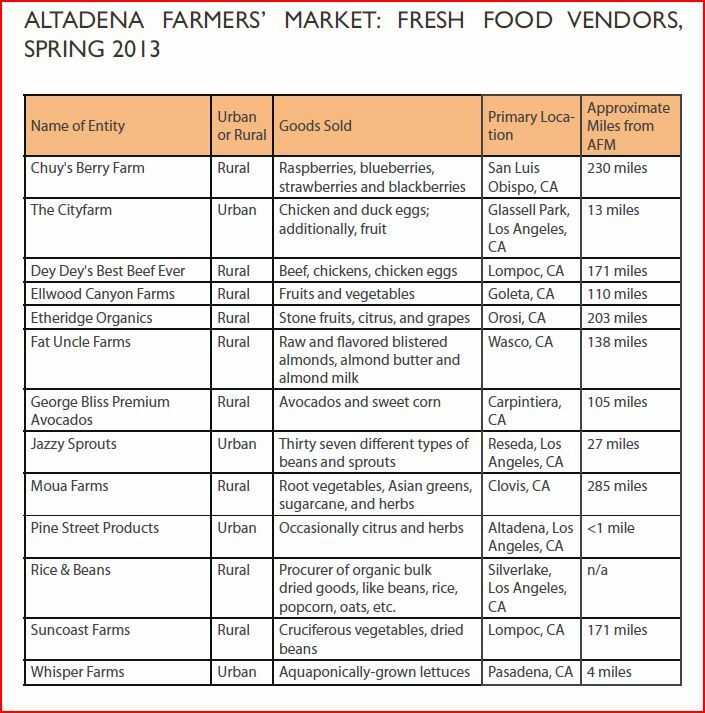 Of the Altadena Farmers’ Market 38 vendors, currently 13 are fresh food vendors. Items that include a step of processing, such as jams, goat cheese, and dried herbs. Twelve vendors at the Altadena Farmers’ Market are artisanal food vendors. Fresh Food vendors favor rural locations, because they grow in larger quantities to keep the per-unit price down. However, these farms can still be considered “small-to-medium” compared to non-organic industrial farming. The value of these goods is partially derived from the fact that customers believe this food is “local” and therefore has more value. More artisanal food vendors produce in an urban setting. Over half of the artisanal goods with rural locations include animal operations: goat cheese, raw dairy milk, and honey. The urban artisans are utilizing their own, craft-based production style to create their goods. Their techniques tend to be more specialized than techniques of producing large quantities in bulk. Based on the research, it’s too early to tell if seeing all of these firms located near each other in space is cause to believe that an industry is agglomerating in and around Los Angeles. Currently, almost all income for these entrepreneurs is considered secondary. 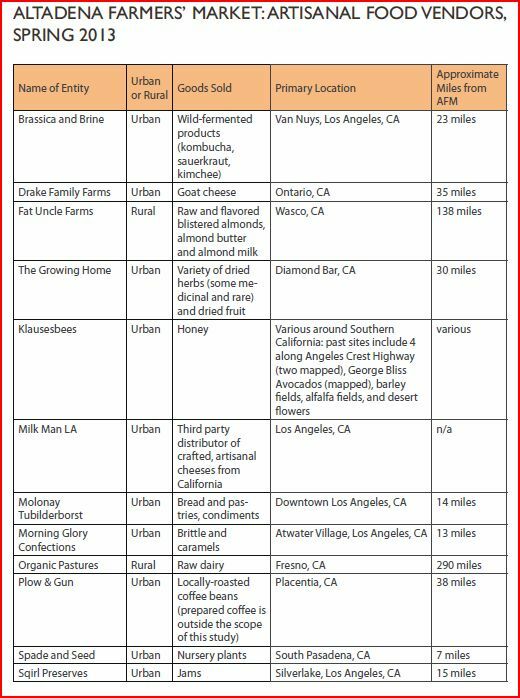 However, there is still potential for this industry to grow, especially the artisanal goods category because they retain more value when sold outside of Los Angeles compared to fresh goods. In order to fuel demand for quality products, subsidy programs like Hunger Action Los Angeles (HALA) should be expanded. HALA’s market match program which doubles EBT dollars at Markets located in low-income areas. Role of urban homesteaders, who grow for subsistence. Role of entrepreneurs selling at different farmers markets and through other modes of distribution.